When a restaurant inspires me to head into the kitchen and try to replicate a dish I had, it’s a good sign. It means I genuinely enjoyed the dish to the point where I want it more often than I can afford to go to that eatery. According to Internet sources (Lonely Planet, Wikipedia, etc) Roman cuisine is simple but full of flavour, relies on seasonal ingredients and features cheap cuts of meat, such as offal (which the Romans call “Quinto Quarto”). Some distinguishing ingredients beside Quinto Quarto include artichokes and Pecorino Cheese. This delicious cheese is made from sheep’s milk and is the preferred cheese for pasta entrees from the region. Just like Parmigiano-Reggiano, Pecorino is often used to finish off a dish. Eaten by on its own, the cheese actually has gamy taste (think goat cheese), although you don’t notice the gamy taste in most pasta entrees. The folks at Campagnolo Roma use Pecorino very liberally. I guess it’s the simplicity of Roman cuisine that foolishly emboldens me to try to copy it at home but that’s where the deception comes in. It’s not as easy as it looks. 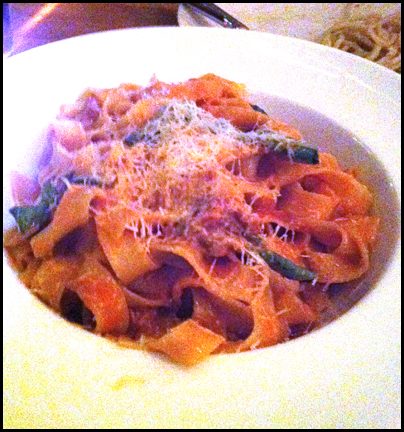 It began last year with their Kabocha sauce pasta. It was novel, hearty and a fantastic pasta for the winter. My first home rendition was more Kabocha mash with bits of noodles, but after 4 adjustments, it’s now a regular item in my cooking repertoire. A dish that typifies food from Rome and served on Campagnolo Roma’s regular menu is the tasty tonarelli cacio e pepe. The pasta is as simple as it gets since it’s essentially 3 ingredients: tonarelli pasta, pecorino romano & black pepper. This dish is all about the Pecorino and Pasta. I think of this straightforward dish as a grown up Roman version of Mac & Cheese. 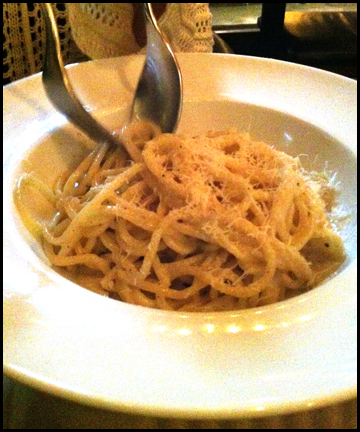 Since I like the taste of Pecorino, I really like the Cacio e Pepe at Campagnolo Roma. When you have menu items that have so few ingredients yet are so enjoyable, it speaks to the quality of the ingredients they use, the know how of the cooks to form cool flavour combinations and their ability to prepare the pastas correctly. Sounds easy but it’s not always so; my home version of Cacio e Pepe is on adjustment #5 – tastes like it should but I get clumps of Percorino. Campagnolo Roma also offers pastas that I know I have no business trying to reproduce such as their Slopping Hills Pork Ragu Tagliatelle accented with basil & Pecorino (daily special item). From the first bite, you could tell the ragu was slow cooked. The sauce had a complex pork flavour. It was hearty and very satisfying. The great thing about Campagnolo Roma is that even if I successfully copy one of their pasta dishes, there’s always something new to try. Campagnolo Roma changes their menu seasonally and always has daily specials. Each time I arrive at this eatery’s door I look forward to discovering new, unfussy and delicious food. Please note, this restaurant does not do reservations. It’s a walk-in, first come first serve, in the neighbourhood kind of place.